Has The Snow Finally Stopped? Step outside and smell the fresh air, America. The high temperature was forecast to be above freezing in almost every single part of the continental United States on Monday. You heat-seekers are rejoicing, surely. But winter-lovers like myself mourn every inch of snow that melts, wistful for a time when the plows rumbled by in full force. There’s still hope, though. The final flakes haven’t fallen everywhere quite yet. Of the 25 largest metropolitan areas that record measurable snow in at least 50 percent of their winters, 16 are still due for one more snowfall. I collected data from the past 50 winters for those cities, and while climatology is not a perfect predictor of the future, it’s a good guide for what’s still to come. Don’t put away the salt and shovels just yet. In more than 50 percent of winters, Boston, New York and Philadelphia saw a last snowfall after March 9. In fact, 25 percent of the time in all three cities, it occurred at the end of March or even later. Boston, 1.9 inches away from its all-time snowfall record, still has plenty of time. It feels like winter really never ends in these regions, but eventually the weather does warm up. 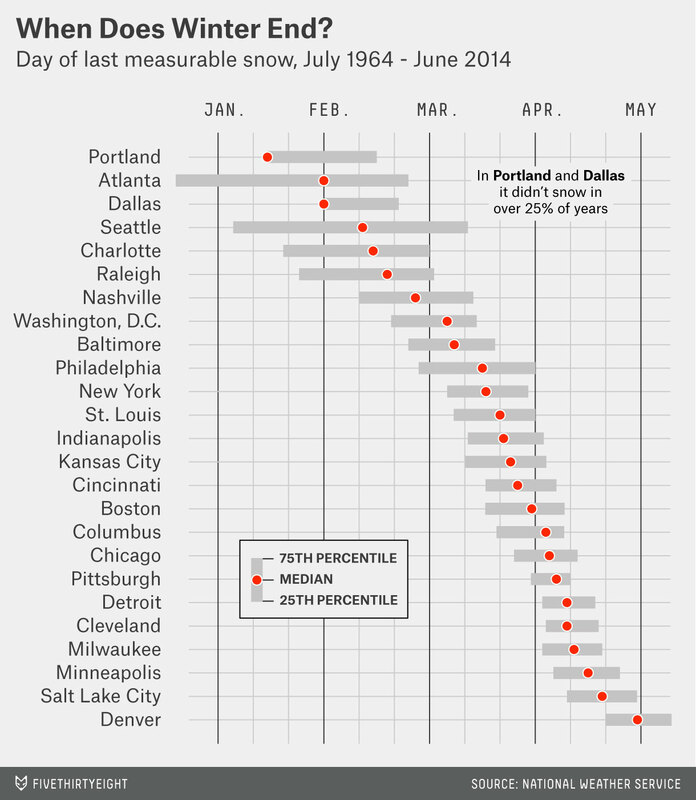 From Pittsburgh to Minneapolis, the last snowfall is in April, more often than not. I can see Jon Lester throwing in the snow right now. This region is just like the Northeast, but in the west. From Cincinnati to Kansas City, snow usually doesn’t stop falling until the last weeks of March. It often snows into April, and sometimes beyond. Cherry blossoms, rejoice! Baltimore and Washington have had late-March snowfalls the past two seasons, but more than 50 percent of the time the last snow had already fallen by now. Further south, across Nashville and the major cities of North Carolina, we’re two weeks or more past the median date for the last snow. Last week’s snow and ice storms across the region were truly unusual. In Atlanta and Dallas, the last snow falls in late February or earlier more than 75 percent of the time. Heck, in many years it doesn’t snow in Dallas at all — 30 percent of its winters are snow-free.1 Just don’t tell that to Leon Lett. It’s not over yet — not even close. The median date of last snowfall in Denver2 and Salt Lake City — late April — is among the latest in the country. As my colleague Nate Silver has pointed out, many of Denver’s large snowfalls have occurred in April. In all my years watching “Frasier” and “Portlandia,” I don’t remember snow ever being a major plot line. And yet Portland3 and Seattle4 do sometimes see snow — but it tends to stop earlier than elsewhere. The snow there usually peters out in January or the first half of February, when it does fall. For many of us, winter is over. For others, the old man is merely hiding behind a tree, waiting to attack us with a snowball. Stay vigilant. Which is to say, measurable snow didn’t fall. Please see this note from the National Weather Service regarding where snow is measured in Denver. Snowfall has not been measured at Portland International Airport since 1996. Snowfall measurements since then have been taken at the Portland National Weather Service office and at KGW studios. I have supplemented these measurements with picture evidence from snowfalls in Portland. Snowfall was not measured at the Seattle-Tacoma International Airport from 1997 through 2003. Snowfall measurements during this period were taken at the Seattle National Weather Service office. I have supplemented these measurements with picture evidence from snowfalls in Seattle.